Could it be curtains for cooling towers? 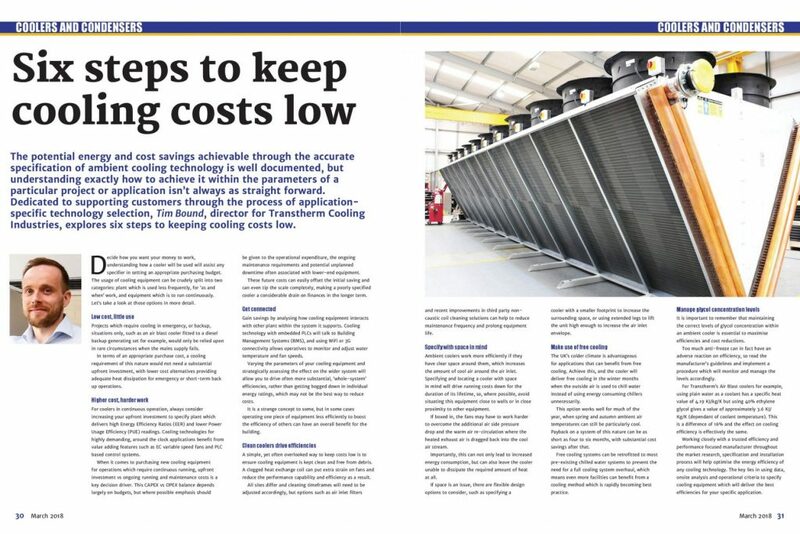 Cooling towers have been used to dissipate heat from ventilation, air conditioning and heating systems in hospital applications for decades, but change is afoot, with growing demand for dry/wet evaporative cooling methods from NHS Trusts and private healthcare providers. 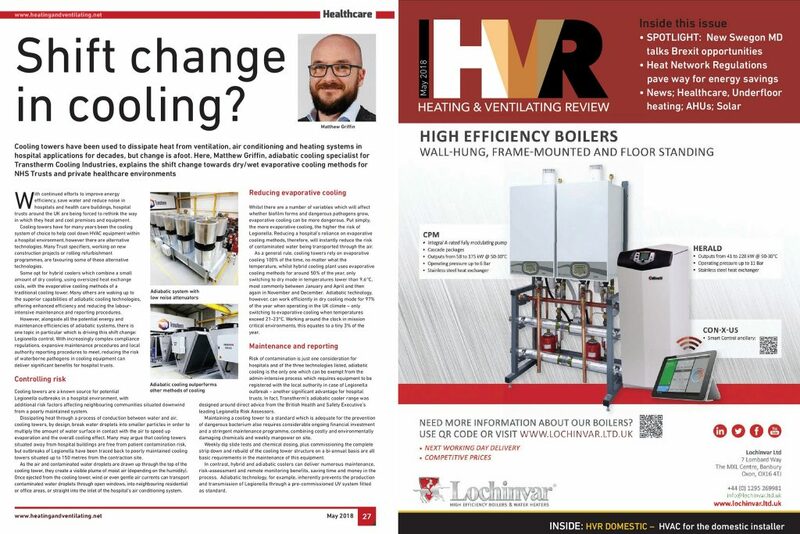 With continued efforts to improve energy efficiency, save water and reduce noise in hospitals and health care buildings, hospital trusts around the UK are being forced to rethink the way in which they heat and cool premises and equipment. Cooling towers, for many years the cooling system of choice to help cool down HVAC equipment within a hospital environment, are now increasingly seen as inefficient and OPEX-hungry in comparison to alternative technologies. 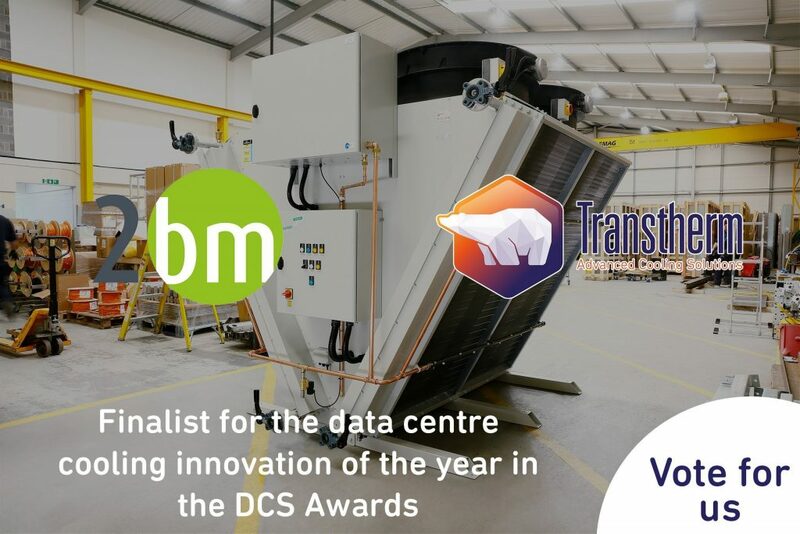 We are increasingly working with Trust specifiers, either on new construction projects or rolling refurbishment programmes, who have moved in favour of more efficient cooling technologies. 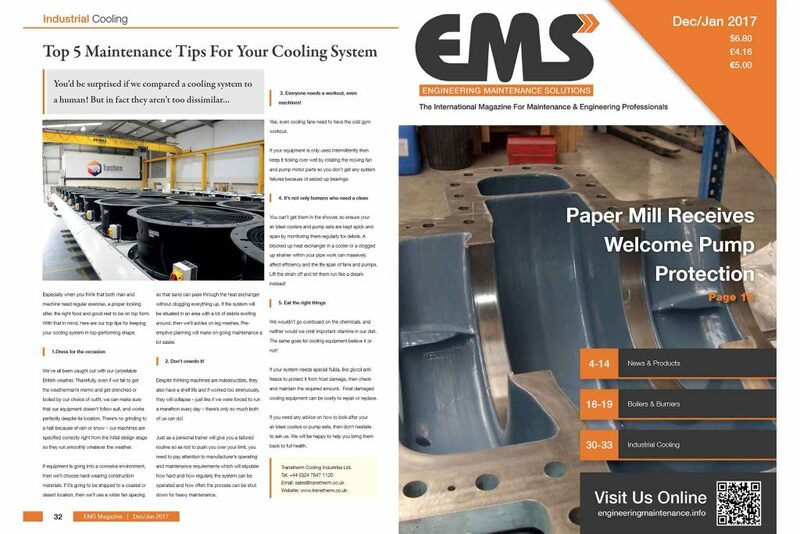 Some opt for hybrid coolers which combine a small amount of dry cooling, using oversized heat exchange coils, with the evaporative cooling methods of a traditional cooling tower. Many others are waking up to the superior capabilities of adiabatic cooling technologies, offering enhanced efficiency and considerably reducing the labour-intensive maintenance and reporting procedures associated with less advanced cooling tower technology. However, alongside all the potential energy and maintenance efficiencies of adiabatic systems, there is one topic in particular which is driving this shift change; Legionella control. With increasingly complex compliance regulations, expansive maintenance procedures and local authority reporting procedures to meet, reducing the risk of waterborne pathogens in cooling equipment can deliver significant benefits for hospital trusts. Cooling towers are a known source for potential Legionella outbreaks in a hospital environment, with additional risk factors affecting neighbouring communities situated downwind from a poorly maintained system. Dissipating heat through a process of conduction between water and air, cooling towers, by design, break water droplets into smaller particles in order to multiply the amount of water surface in contact with the air to speed up evaporation and the overall cooling effect. Many may argue that cooling towers situated away from hospital buildings are free from patient contamination risk, but outbreaks of Legionella have been traced back to poorly maintained cooling towers situated up to 150 metres from the contraction site. As the air and contaminated water droplets are drawn up through the top of the cooling tower, they create a visible plume of moist air (depending on the humidity). Once ejected from the cooling tower, wind or even gentle air currents can transport contaminated water droplets through open windows, into neighbouring residential or office areas, or most worryingly, straight into the inlet of the hospital’s air conditioning system. Whilst there are a number of variables which will affect whether biofilm forms and dangerous pathogens grow, it is true to say that evaporative cooling is more dangerous. You can read more about how we cut out Legionella risks from our adiabatic range here, but put simply, the more evaporative cooling, the higher the risk of Legionella. Reducing a hospital’s reliance on evaporative cooling methods, therefore, will instantly reduce the risk of contaminated water being transported through the air. As a general rule, cooling towers rely on evaporative cooling 100% of the time, no matter what the temperature, whilst hybrid cooling plant uses evaporative cooling methods for around 50% of the year, only switching to dry mode in temperatures lower than 9.6°C, most commonly between January and April and then again in November and December. 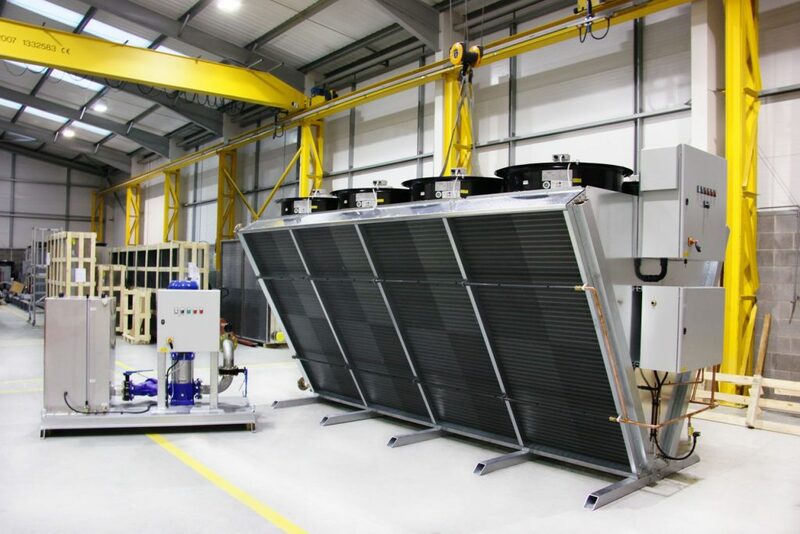 Adiabatic technology, however, can work efficiently in dry cooling mode for 97% of the year when operating in the UK climate – only switching to evaporative cooling when temperatures exceed 21-23°C. Working around the clock in mission critical environments, this equates to a tiny 3% of the year. Risk of contamination is just one consideration for hospitals, however. Of the three technologies listed, adiabatic cooling is the only one which can be exempt from the admin-intensive process which requires equipment to be registered with the local authority in case of Legionella outbreak – another significant advantage for hospital trusts. In fact, Transtherm’s adiabatic cooler range was designed around direct advice from the British Health and Safety Executive’s leading Legionella Risk Assessors. Maintaining a cooling tower to a standard which is adequate for the prevention of dangerous bacterium also requires considerable ongoing financial investment and a stringent maintenance programme, combining costly and environmentally damaging chemicals and weekly manpower on site. Weekly dip slide tests and chemical dosing, plus commissioning the complete strip down and rebuild of the cooling tower structure on a bi-annual basis are all basic requirements in the maintenance of this ageing equipment. In contrast, hybrid and adiabatic coolers can deliver numerous maintenance, risk-assessment and remote monitoring benefits, saving time and money in the process. Adiabatic technology, for example, inherently prevents the production and transmission of Legionella through a pre-commissioned UV system fitted as standard. Yet another reason why hospitals are turning away from cooling towers in favour of more advanced cooling technologies. This comment was featured in the May 2018 issue of Heating & Ventilating Review. Discover the Transtherm product range here, or call our team on +44 (0)24 7647 1120 to discuss your next project.